A lot of wearers love the streamlined look of the Nike PG 2.5. Some wearers appreciate the improvements made on these Nike basketball shoes’ cushioning system. A good number of players love that this pair of kicks from the Swoosh is supportive. The materials that these Nike shoes are made of effectively work together to ensure a comfortable ride, a number of wearers observe. This offering retains the cheap $110 price of the Nike PG2. If wearers prefer a high-top basketball shoe in the same price, they can opt for the tenth Nike Hyperdunk. There is no information on the fit of this pair of Paul George basketball shoes. A few testers feel that the 2.5 is basically just the PG 2 with a strap, and it is absolutely not necessary to have this as a separate release. 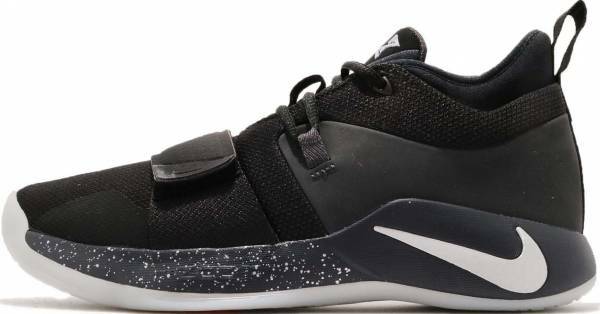 Save for the strap, these Nike PG shoes are in many ways similar to the Nike PG2. It is sold at the same price, too. So, if you are satisfied with how the Nike PG2 performs, then this shoe will surely be OK for you. In fact, this considered a good precursor to the critically acclaimed Nike PG3. It's pretty much identical to the PG 2s with the strap. But it is improved and better in terms of performanace-wise. So you know for people who want to get super technical that the shoe is better than the previous ones whereas the 2.5 is better than 2, I would give these like a 4.75. The shoe is pretty much the same as the PG 2s but slightly better in terms of the lockdown and the fit. Everything else is the same. The traction is the same. The cushioning is the same. You're getting a really good performance hoop shoe with a lot of good performance aspects. And the best part of the shoe, it's a $110 which is the same price as the PG 2s. Just a little better for the same price. I really like the PG signature line over the last two years where I had the PGs and my go-to rotation for hoop shoes and I'm excited to see what Nike and PG are gonna bring in the upcoming year. The PG 2 aesthetically to me, it looked like it was missing something and the strap (PG 2.5) solved it for me. Also they are coming out with super sick colorways in the PG 2.5. I think they look way more dope than the PG 2 colorways. So I would highly recommend picking up a pair of the PG 2.5. If price is a big issue, you could get the PG 2s and you'd be getting a very identical shoe. Like I said, the only difference is the strap and I do think that the strap just adds a little bit more support. And price isn't an issue, get the PG 2.5. You all won't be disappointed. There is really no support issues laterally, as far as containment in the 2. So, the 2.5 is all just gonna add. You would think a little more support laterally but I think to be honest, i'ts more of an aesthetic move and I do think it looks better. Moving on to the fit, it is the same exact fit but I would say the 2.5 was a little bit more narrow for me but not much of a difference lengthwise. True to size and fit is absolutely very, very good actually for my foot. Everything else is exactly the same. The PG 2.5 is just a solid shoe all around. The best description I can give it is that it’s a “jack of all trades” shoe – it gets the job done on all accounts, with no real failures anywhere. I think that’s a great thing, as many shoes have huge outlying flaws and many of them have these huge trade-offs, whereas this one has none, while offering you everything you need. While many shoes have excellent areas and hugely strong focuses that may justify getting them for an extravagant price, the 2.5 lets you play without worrying at all. Decent traction, decent support, and decent cushioning – you can’t really complain with this shoe. Something to compliment this shoe with is how it’ll be able to apply to just about any shoe customer. Adjustable lacing, as well as the adjustable strap, will make it easy for any foot to really get in these and play. In a budget shoe like this, the PG 2.5 can really get in as a good basketball shoe overall. It’s a signature shoe coming in at only $110 dollars – it’s a near steal, if you don’t mind silly aesthetics. The low-top PG 2.5 is a hybrid that features many elements from the PG2 and a few from the PG1. It has the PG2’s silhouette, overall structure, detailing, and technological makeup. It has the PG1’s signature strap, which is modified to further enhance the product. In a way, therefore, the PG 2.5 is offering the best of both worlds. Cushion. The Nike PG 2.5 has an 11-mm-thick Zoom unit at the forefoot. This unit is not at all topped or lined underneath with foam; the wearer really steps on and is propelled by the actual Zoom unit. The heel has a cored-out foam at the heel to provide the necessary cushioning. Traction. The 2.5 pretty much has the outsole setup of the the Nike PG2. It has the strategically placed pistoned zones that ensure flexibility. The part where the Zoom unit is situated is also made to protrude a bit to contain the thickened unit. It also has the special type of cymatic pattern that covers the full length of the outsole. These elements combine to provide multidirectional support. Length and Width. There are not too many details regarding the fit of the Nike PG 2.5. If at all possible, it is best for new buyers to try this shoe in local stores before making online purchases. If this is not feasible, then getting their true Nike sizes is probably the safest way to go. Lockdown. Support is the domain where the Nike PG 2.5 differs significantly from the second Paul George shoes. The 2.5 ditches the dynamic wings and instead uses a midfoot strap, which is actually one of the defining features of the Nike PG1. Lead designer Tony Hardman says that it’s Paul George idea to bring back the strap. The team made a few modifications, however. “Instead of incorporating Flywire as we did on the original, we conceived a new strap for the PG 2.5 built from a new webbing," Hardman shares. Whatever material it is made of, this strap will surely help in ensuring a secure lockdown. The shoe also has a small TPU block embedded at the midfoot. This keeps the ride stable. This feature also protects the wearer from torsional twists. The Nike PG 2.5 pretty much uses the same materials as the PG2. Its upper is made of mesh that ensures high levels of breathability. The inner sleeve is generously padded to provide next-to-skin comfort. The Nike PG 2.5 is generally styled like the PG2s. It features a Swoosh on the rear lateral side of the midsole cage; it has another on the medial side panel. It also has Paul George’s actual signature embroidered on the underside of the tongue. Right below the heel pull tab of the left shoe is the PG logo; on the same spot on the right is Paul’s jersey number 13. The outsole has the PG logo in the heel area. A major difference is the positioning of the PG logo on top of the tongue. On the Nike PG2, this element is centered and horizontally oriented to look like a bowtie. In the PG 2.5, the logo is made smaller and is left aligned on the left shoe and right aligned on the right shoe. These logos are vertically oriented such that they look more like an hourglass. Because of its low collar, these Paul George basketball shoes look great when paired with casual items such as jeans and short pants. Being performance items, they are always easy to pair with different types of active wear. The release of the Nike PG 2.5 is devoid of the fanfare that characterized the release of the PG2. It debuted in a Black/Pure Platinum-Anthracite colorway. This rendition has a predominantly black upper that sits on top of a white outsole. The detailings on the upper such as the Swoosh and PG logos are made pure platinum to make a sharp contrast against the dim color of the upper. The protruding part and the PG logo on the outsole are rendered in neon pink and orange. Paul George’s off-court hobby is playing on his PlayStation. Nike collaborated with Sony PlayStation to create a colorway inspired by the 1995 model of the gaming console. The PlayStation x Nike PG 2.5 comes in a combination of white, royal blue, and wolf grey.